"This how you sleep today. Self Check In around the clock. No long waiting." This is how the Hotel Caldor, close to the City border of Vienna, promotes the Hotel. A fallow land, just 8 minutes from the City border of Vienna City and very close to the biggest Shopping Centre of Austria, gave the landlord the idea to create a Self Check In Hotel. The site is next to a main road - B16. The structure of the Hotel emerges along the road. From the centre cross point the Hotel is buckling. 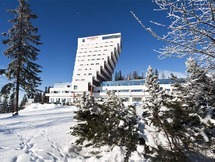 The buckling gives the Hotel a high profile from the main road - both directions. At the cross point you find the lobby, the main access, the check in machine, etc. The curtain wall is on hand the protection against weathering for the cross point. On the other hand it also gives shade and shelter. 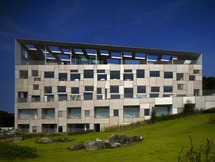 The perforation of the façade panels plays with the logo of the Hotel, abstract its. Interesting spaces inside / outside are created which emphasizes the communication between them. Low building cost where the basis for moderate fees for the rooms. A single room has the size of only 10 m2, double rooms only 14 m2 including bathrooms. The combination of used colours and the use of just a glass wall as a separation between the room and the bathroom has created rooms which doesn't feel small, even they are.